Tina is a long range combat robot, capable of creating phase power. She was Trainer's apprentice during the first Dimensional War. Tina can use various types of weapons like Snipers, Rifles, Rocket Launchers and other types of Guns. Tina's First Passive "Imaginary Space"
Tina can use the up directional key to attack upwards or the down directional key to throw a grenade that will launch enemies into the air. 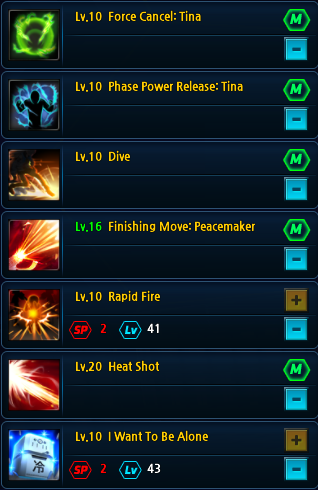 When attacking upwards with Tina's basic attack or skills, she gains the [Fluctuating Bullet] buff. This buff stacks 10x. Rush forward and catch the enemy with a knife. When the catch fail, Tina escapes and attacks with a shotgun. It emits a powerful laser toward the front. Holding skill key to fire longer. Rush quickly towards the enemy and grab them with sniper. Attack the enemy by moving to suppress the area. Puts all of the heat generated in the body into a bullet for a powerful strike. 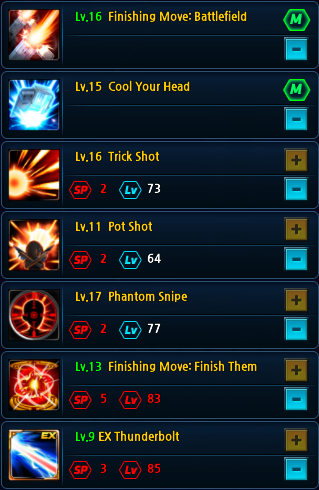 Upon learning Heat Shot, gain 1 stack of Overheat every time you use a skill, stacking up to 10 times. Overheat will be consumed to increase the damage of Heat Shot. When holding the up directional key, attack towards the air. Tina enters the refrigerator and avoids enemy attacks. Cools Tina quickly. While being in the refrigerator, she is immune to all damage. Function enhanced. Drop damage is increase by 50%. When chain skill is 3 or higher, skill cooldown is reduced by 3 seconds and physical damage is increased by 20%. Summons multiple rockets and destroys the front. Track down enemies with certain radius to inflict significant damage. Take evasive measures while firing a shotgun. Tina fires a sniper shot that deals critical damage to enemies. Hold skill key to head-shot the target. Head-shot deals more damage. Pressing the up arrow key will instantly fire a head-shot towards the air. Attacking upwards deals more damage. Upon triggering a head-shot, gain the [Tracking Sequence] buff. Tina hacks a random satellite from orbit and uses its firepower to cause an explosion. Hold the skill key to aim the attack location. Physical Defense Penetration +10% /Physical Crit Damage +10% / Crit Damage on Chase +10%. Tina's Second Passive "Imaginary Horizon"
Tina has mastered her ability to control imaginary space, adjusting to the battlefield changing her battle stance as she sees fit. [Fluctuating Bullet] now stacks to 15 and last for 60 seconds. Also, When using an attack that grants [Fluctuating Bullet] Tina will get [Battleground Adjustment]. When an EX skill is used with 10 stacks of [Battleground Adjustment], an enhanced attack 15% damage will be cast. Cooldown Reduction will not be applied in PvP. Fire a powerful laser of energy towards the front. When holding the up directional key when casting, attacks towards the air. Every hit lowers the enemy's critical damage reduction stat. This effect last 10 seconds. [Overheat] Charge will increase by 1 when this skill is used total of 4. Damage done to enemy EX Thunderbolt increased 30%. Tina will catch the enemy when lunging attaching C4 to your targets while she passes through them, Hold the key for full skill. Has a chance to reduce max HP of enemy by 1% per hit. Chance to give [Fluctuating Bullet] each additional hit. Creates a cube of imaginary space attacking all enemies inside it with tremendous attack power, requires [Overheat] to use this skill. 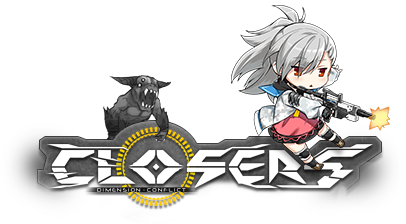 Calls the advanced combat equipment, Destroyer from Imaginary Space to disrupt enemy's defense. This is my PvE build. These are the chips you wanna aim towards end-game. Probably should have put this up top but oh well.. 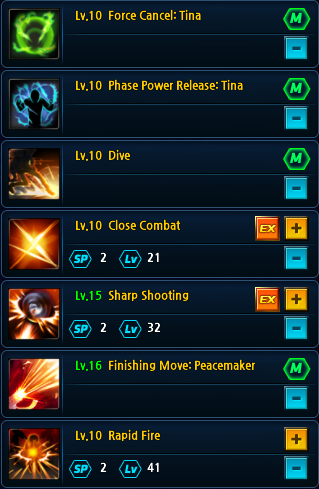 These skills should be prioritized before any other. This isn't a Buff for Tina but a Debuff for the enemy, This reduces enemy defense. pretty good writeup, thanks for the guide! Really needed this! Thank you!! Please. Unpin my guide and pin Nett's one. awesome, the updated one! thanks anyway! is the PNA still the same? David / Irina Gear (A8) Level 80 Set Requires the Bugs you get from clearing the Raids to craft, and Hollow Booster from Tiamat. This is a great guide!! I am just confused on your skill points for sharpshooting. You have it here @ 3, but in game to get expert, it needs to be 6. What to do?! The expert cube is probably not worth grabbing, so he left it at 3 to conserve skill points. I did it to conserve points as Dino said and it is worth grabbing for the extra damage you can do events that C:C adds to get skill books and max out the skills if you want them maxed, Also it requires 5 to get Expert Cube not 6. I just posted an earlier picture of it I actually have mine at 5. Then I am not sure what's going on with my skills, Lol. It has to be 6 for my expert cube to enable. 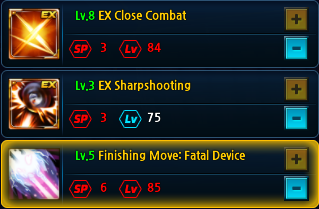 That's normal Sharp Shooting EX takes 5. EX is what you wanna use in PvE because regular one isn't that good in PvE but in PvP it is. Can I get your skills/passives for pvp? Added my PvP skills. 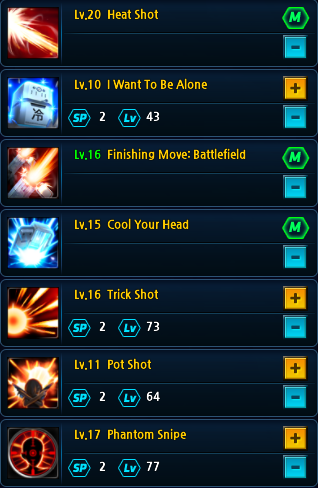 Passives don't really change I use the same ones for both PvE/PvP.